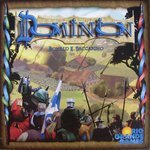 Dominion is not a CCG, but the play of the game is similar to the construction and play of a CCG deck. The game comes complete with roughly 500 cards. You select 10 of the 25 Kingdom card types to include in any given play -- leading to immense variety.